Whether you’ve been working with horses for just a few months or have been at it for decades, there’s always something new to learn. 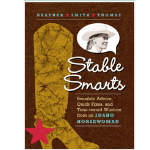 In Stable Smarts, Heather Smith Thomas offers practical advice, quick fixes, and unconventional wisdom gleaned from a lifetime spent with horses. Covering everything from tack and knot-tying to feeding, foaling, and medical care, these tips will save you time, money, and energy while keeping your horses healthy, happy, and working efficiently.